As there are only few published data about nutritional knowledge of nurses in Turkey, the aim of the current study was to determine the nutrition knowledge level of the nurses working at three hospitals in Zonguldak, Turkey. The research was conducted among randomly selected 302 nurses working in three major hospitals in Zonguldak, Turkey. The research data were collected by means of a questionnaire. The questionnaire was developed specifically for this study, based on literature and professional clinical experience. To test face validity, content validity and clarity, 5 specialists in the field of clinical nutrition in Turkey who are members of the educational committee of Turkish Society of Parenteral and Enteral Nutrition were asked to judge whether the questions appeared to be reasonable, covering relevant and important data with clarity. This resulted in minor linguistic changes and layout changes. A pilot test was conducted with eight nurses who were not involved in the study, but worked in the same areas. On the basis of their comments, the questionnaire was revised for clarity and ease of use. The questionnaire contained three sections. In the first section there were questions about the demographic characteristics, the history of education and practices in institutional and working areas of the applicants. In the second section, opinions relating to basic subjects in clinical nutrition were to be expressed. In the third section, 20 multiple choice questions were asked under 5 main sections to assess the attitudes and knowledge of nurses about clinical nutrition; the assessment of the nutritional status of the patient, planning nutritional support, practicing nutritional therapy, and observation and assessment of the patient receiving nutritional support. The Medical Ethics Committee of the Research and Training Hospital of University of the Zonguldak Karaelmas gave their approval. Consent also was obtained from the director of the nursing department and ward nurse managers. After the data was transferred to the “SPSS for Windows” program, the knowledge scores of participants were calculated over 100 and mean values were displayed as “arithmetic mean± deviation”. The achieved results were analyzed with the ANOVA One Way Post Hoc Tukey Test, Correlation Pearson Test, and Student-t Test between groups with the interval of 95% confidence. The average age of respondents was 27.9 ±5.5 years, with the majority of respondents aged between 23 and 30 years. Thirthy-four per cent of nurses had an undergraduate degree and 32.2 % a graduate degree. Most of the respondents (47.35%) had been working as a nurse for 0-4 years. The mean nutrition knowledge of all participants was obtained as 49.44±10.95 over 100 points. Questions asked and percentage of nurses with correct answers was given in Table 1. As can be seen in Table 1, only 2 of the 20 questions were answered correctly by more than 70.0% of the nurses (questions 9 and 17) while 3 questions were answered by less than 20.0% (questions 10, 11, 16). The best known item (answered correctly at the highest rate) by the nurses was that “symptoms of catheter infection” (79.5%). This was followed by the enteral access types (72.5%), and the nutrition support team (68.2%). The nurses involved in the research had the least knowledge about the complications of enteral nutrition support (17,2%). Two other items that nurses had little knowledge about were that enteral nutrition support methods (18,9%) and osmolarity rates to prevent thromboembolism in periferic vens (19,5%). The nurses who conducted nutritional assessment activities had a greater knowledge score (52.42±15.7) than who did not (47.54±16.4) (p=0.012, Table 2). It was observed that the higher knowledge level of the nurses is, the more they examined patients and noticed malnutrition. The educational status and the knowledge scores of the nurses were presented in Table 3. Nurses, who had graduate degree (32.1%), obtained the highest score with 54.37±14.04. There was statistical significance among the groups (p=0.000) and it was observed that the difference was result from the low knowledge scores of the secondary graduates. There was no statistically significant difference between nutrition knowledge scores and attending a nutrition course during formal education (p=0.289, Table 4). One hundred and twenty nine nurses (47 %) believed that nutrition education was not considered important in nursing schools. Also one hundred and forty four nurses (42%) stated that they completely agreed with the presence of the relation between diseases and nutrition. 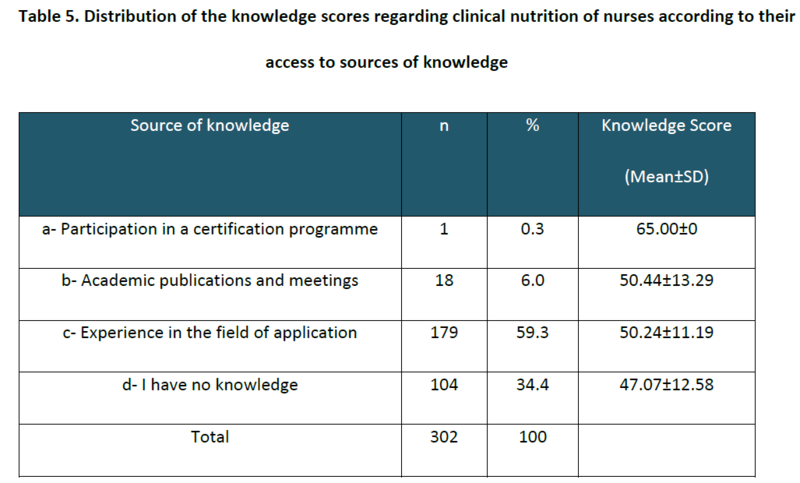 Only one nurse (0.3%) had nutrition knowledge by participating some certification programmes. Eighteen nurses (6.0%) explained that they had their knowledge by reading academic publications and attending meetings. Most of the nurses (59.3 %) explained that they had their knowledge from their experience. The others (34.4%) had “no knowledge” in this field (Table 5). No statistical significance was found between these results when the one nurse who had participated in a course was excluded (r =0.080). There was no significant difference between years of nursing experience and clinical nutrition knowledge scores (p=0.827, Table 6). It was observed that nurses working in hospitals which had a nutrition team reached 53.11±1.4, whereas nurses working in hospitals which had not a nutrition team reached 47.59±1.24 and the differences between the groups were statistically significant (p=0.006). In the current study, the mean general knowledge score was 49.44±10.95 per cent. It was also shown by various authors that nurses, had a poor knowledge of nutrition Schaller and James  reported a mean score of 60 per cent (SD = 8.4) for Australian nurses. Crogan et al.,  reported a mean score of 60 per cent (SD =11). Warber et al.,  reported a mean score of 66 (SD = 8). Given the previous research, the mean knowledge score of nurses at 49.44 per cent must be considered low to moderate. Nurses who conducted nutritional assessment activities had a greater knowledge score than who did not (p=0.012). It was observed that the higher knowledge level of the nurses is, the more they examined patients and noticed malnutrition. Similar to these findings Crogan and Evans  expressed in their study that nutritional assessment activities were directly correlated with the knowledge about nutrition. The knowledge level of nurses was found to be higher (p=0.006) due to the nutrition education received and higher level of professionalism in the application of their knowledge, when there was a nutrition team in hospital they work. Yet, the increase in knowledge scores was not found to be in correlation with the increase in professional experience. Crogan and Evans  also reported that clinical experience didn’t increase the level of the nutritional knowledge and it was showed that there was a correlation between the educational substructure and the nutrition knowledge score. Long-term nursing experience without any special education on nutrition and with no working experience in this field does not increase the nutrition knowledge. When examined from a general point of view, a difference in clinical nutrition level could not be found between nurses having worked four years vs. 20 years. In contrast, a majority of the nurses explained that they gained their knowledge about clinical nutrition from their professional experiences. This may emphasize that education is better than conventional clinical experience when it comes to clinical nutrition. In the opinion of 47.7% of the nurses surveyed, nutrition was not given enough importance during their education in Turkey. Without a good knowledge base nurses cannot provide appropriate nutritional. It is apparent that there has been too little emphasis on clinical nutrition in Turkish universities. Under the enlightenment of this data, it is observed that an increase in clinical nutrition knowledge cannot be provided in the working area. Thus the requirement and importance of an education in nutrition in nurse education programs emerges. In Turkey, nutrition education complains only basic nutrition clinical nutrition education is not adequately included. The curriculum should be revised in order to educate nurses having satisfactory qualities in this field of study. The main target in this education ought not to be training nutrition nursing, but increasing the clinical nutrition levels as a part of clinical application and patient care service. After basic education is given according to the new curriculum, institutions themselves should start working towards completing their education with postgraduate education, and in-service trainings and “Postgraduate Certificate Programs” should be founded by related vocational establishments. In conclusion it is determined that the nutrition knowledge of nurses working in our country is not adequate; therefore an educational support system is needed both at schools and in hospitals. The reform and reorganization of educational curricula is crucial. There was no conflict of interests in the preparation of the manuscript. We are indebted to the members of the educational committee of Turkish Society of Parenteral and Enteral Nutrition who reviewed the questionnaire forms. Meier R, Stratton RJ. Epidemiology of malnutrition.In: Sobotka L (ed). Basics in clinical nutrition. 3rd ed, Prague: Publishing House Galen, 2004; 31–7. Mowe M, Bosaeus I, Rasmussen HH, Kondrup J, Unosson M, Rothenberg E, Irtun Ø, Scandinavian Nutrition Group. Insufficient nutritional knowledge among health care workers? Clinical Nutrition 2008; 27(2): 196-202. Persenius M W, Hall- Lord M-L, Bååth C, Larsson BW. Assessment and documentation of patients´ nutritional status: Perceptions of registered nurses and there chief nurses. Journal of Clinical Nursing 2008; 17(16): 2125-2136. Allison S.P, Stanga Z. Organization of nutritional care. In: L. Sobotka, (ed). Basics in clinical nutrition. 3rd ed, Prague: Publishing House Galen, 2004; 135-139. Dudek SG. Malnutrition in hospitals: who's assessing what patients eat? American Journal of Nursing 2000; 100 (4): 36-43. Crogan N, Evans B. Nutrition assessment: Experience is not a predictor of knowledge. The Journal of Continuing Education in Nursing 2001; 32 (5); 219. K?m H, Choue R. Nurses’ positive attitudes to nutritional management but limited knowledge of nutritional assessment in Korea. International Nursing Review 2009 Sep; 56(3): 333–339. Jefferies D, Johnson M, Ravens J. Nurturing and nourishing: the nurses’ role in nutritional care. 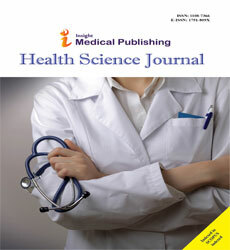 Journal of Clinical Nursing 2011; 20 (3-4): 317–330. Crogan NL, Shultz JA, Massey LK. Nutrition knowledge of nurses in long-term care facilities. J Contin Educ Nurs. 2001; 32 (4): 171-176. Warber JI, Warber JP, Simone KA. Assessment of general nutrition knowledge of nurse practitioners in New England. J Am Diet Assoc. 2000 Mar; 100(3): 368-70. Özçelik AÖ, Surucuoglu MS, Akan LS. Nutrition Knowledge Level of Nurses in Turkey: Ankara as an Example. Pak. J. Soc. Sci. 2007; 4(3):485-489. Kowanko I, Simon S, Wood J. Nutritional care of the patient: nurses' knowledge and attitudes in an acute care setting. Journal of Clinical Nursing 1999; 8 (2), 217-224. Mlodinow SG, Barrett-Connor E. Physicians and medical students' knowledge of nutrition. Acad Med. 1989: 64 (2): 105-6. Morgan SL, Weinsier RL, Boker JR, Brooks CM, Feldman EB, Read MS (A comprison of nutrition knowledge of freshmen and senior medical students: a collaborative study of southeastern medical schools. J Am Coll Nutr 1988; 7 (3): 193-7. Temple NJ. Survey of nutrition knowledge of Canadian physicians. Journal of the American College of Nutrition 1999; 18(1): 26-29. Yfanti E, Tsiriga S, Yfantis A, Tiniakou I, Mastrapa Evaggelia. Nutrition knowledge in students of a Nursing School. Health Sc?ence Journal 2011; 5 (2): 118-127. Schaller C, James EL. The nutritional knowledge of Australian nurses. Nurse Educ. Today, 2005;25(5): 405-412. Perry L. Nutrition: a hard nut to crack. An exploration of the knowledge, attitudes and activities of qualified nurses in relation to nutritional nursing care. Journal of Clinical Nursing 1997;6(4): 315–324.